Street Fighter Unlimited is the latest ongoing Street Fighter comic from UDON Entertainment and it's quite a hit. Readers love getting a monthly fix of Street Fighter, so wouldn't a bunch of months at once be even better? UDON Entertainment seems to think so and they're collecting the first four issues this July in Street Fighter Unlimited Vol. 1 Hardcover. The collection will also feature new bonus content as well, such as a new cover by Edwin Huang and Genzoman and an all-new six-page story drawn by Hanzo Steinbach, featuring a brutal, no-holds-barred showdown between Shadaloo kings Balrog and Vega. Join a huge cast of fan-favorite World Warriors pulled from every era of Street Fighter as they embark on an epic, brand-new world-spanning adventure! As Ryu sets out on a treacherous journey to gain control of the Satsui no Hadou within him, Chun-Li, Guile and Cammy confront the remnants of Shadaloo in order to pull back the curtain on Gill’s mysterious secret society. With Street Fighter Unlimited, celebrated UDON writer/artist duo Ken Siu-chong and Joe Ng bring the world of Capcom’s beloved fighting game franchise to life like never before – and that’s not even counting all the compelling guest stories by other renowned creators, like Huang, Jeffrey Cruz, Sarah Stone, Jim Zub, Adam Warren, and Omar Dogan! Toronto, ON – May. 16, 2016 – Are you ready for a whole new way to experience Street Fighter Unlimited, UDON Entertainment’s latest ongoing Street Fighter comic? Perhaps the monthly format just isn’t for you, and you’d rather settle in with several issues at once without having to wait for each one? Whatever the case, we are pleased to announce the first hardcover edition of Street Fighter Unlimited, collecting the series’ first four issues as well as never-before- seen bonus content in one elegant volume – and with a planned July release, we can’t think of a better way to beat the summer heat! Join a huge cast of fan-favorite World Warriors pulled from every era ofStreet Fighter as they embark on an epic, brand-new world-spanning adventure! 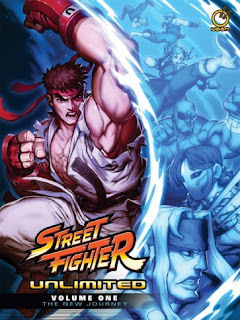 As Ryu sets out on a treacherous journey to gain control of the Satsui no Hadou within him, Chun-Li, Guile, and Cammy confront the remnants of Shadaloo in order to pull back the curtain on Gill’s mysterious secret society. With Street Fighter Unlimited, celebrated UDON writer/artist duo Ken Siu-chong and Joe Ng bring the world of Capcom’s beloved fighting game franchise to life like never before – and that’s not even counting all the compelling guest stories by other renowned creators, like Edwin Huang, Jeffrey Cruz, Sarah Stone, Jim Zub, Adam Warren, and Omar Dogan! In addition to the series’ first four hard-hitting issues, Street Fighter Unlimited Vol. 1 Hardcover includes awesome bonus content you won’t find anywhere else, such as a new cover by Edwin Huang and Genzoman. But why stop at a new cover? We’re also throwing in an all-new six-page story drawn by fan-favorite artist Hanzo Steinbach, featuring a brutal, no-holds- barred showdown between Shadaloo kings Balrog and Vega!